Catfish fillets are a low-calorie source of protein. By grilling catfish fillets instead of frying them, you cut back on the amount of fat in the final dish. Choose lean grilled catfish as the centerpiece of a healthy meal. Serve the fish alongside brown rice or another healthy grain and plenty of lightly steamed vegetables for a delicious dinner. Serve grilled catfish plain or alongside a tasty homemade salsa full of fresh tomatoes. Rinse the catfish fillets with water, and use paper towels to pat the fish dry. Season the fish with a small amount of salt and pepper. Omit the salt if you are watching your sodium intake. Coat the fish with a small amount of your favorite marinade, if you'd like, to infuse the meat with a certain flavor. Preheat a gas or charcoal grill to medium heat. Check that the internal temperature of the grill reaches 375 to 400 degrees Fahrenheit. Let the fish rest at room temperature for 15 minutes. Brush the grill surface with olive oil to prevent the fish from sticking. Use an internal meat thermometer to check that the catfish is completely cooked. 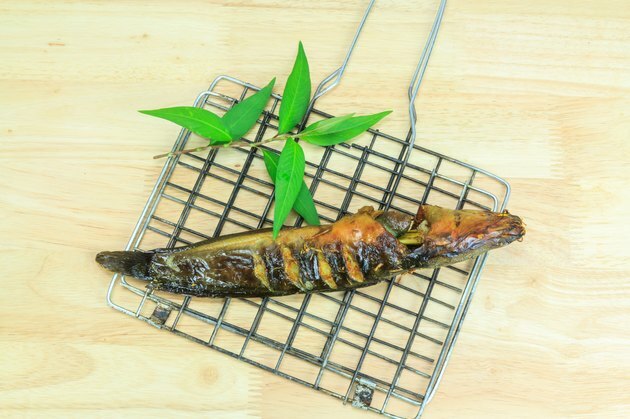 Remove the fish from the grill when the internal temperature reaches 145 degrees Fahrenheit. Serve the catfish hot with salsa or lemon wedges, if desired. Make a homemade marinade with a small amount of olive oil, citrus juice, garlic and spices to cut back on the fat and calories in prepared marinades. Place grilled catfish fillets on a whole-wheat bun for a healthy sandwich. Can You Eat Limes When You're Pregnant?